описание (ru) Dashcam Viewer программное приложение для просмотра фильмов, данных GPS и данных датчика удара, записанных вашим видеорегистратором или экшн-камерой. DashcamViewer поддерживает более 70 моделей камер. Полный список поддерживаемых камер и функций см. ниже. Don’t see your dashcam model here? 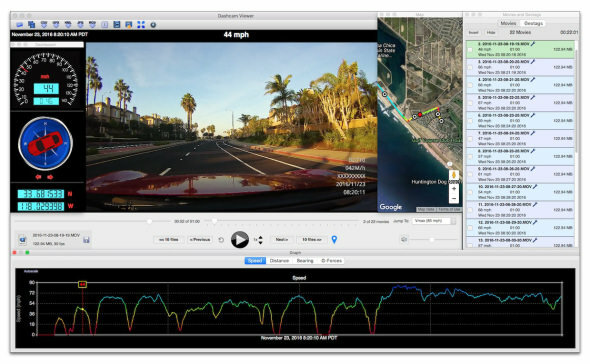 See the FAQ page, question #1.
description (en) Dashcam Viewer is a software application for viewing movies, GPS data, and shock-sensor data recorded by your dashcam or action cam. Dashcam Viewer supports over 70 camera models. See below for the complete list of supported cameras and features. • PiP is now available on Windows version. - lite codec pack URL when you run it for the first time. • The occasional black screen issue is largely improved. • Max accelerated playback speed increased from 2x to 5x. • Vehicle position and route now display correctly in Google Maps option. • Added support for Vantrue N2 Pro dashcam. • work even if the mouse was in the movie frame window. • Minor bug fixes to Movies and Geotags Window, Dashboard display. DCV3 is 64-bit. No 32-bit version available. • Added Fullscreen mode. Use Cmd -F (Ctrl -F on Windows) to toggle between Fullscreen and regular modes. The spacebar-to-pause/resume feature now works even if the main window is not in the forefront. The Time Preferences have been simplified. The Auto-Fix Time Offset button, the Always Auto-Fix Time Offset button, and the Time Offset field have all been removed. These have been replaced with a Time Bias. The Time Bias allows you to fine-tune the synchronization of the video with the vehicle’s map position. In most cases this can be left at ‘0’ seconds. The ability to save settings on a per-movie basis was removed. This legacy feature is rarely necessary and could cause data sync issues if not properly used. Legacy *_settings.dcv files will now be ignored. Some dashcams occasionally produce GPS data out of chronological order or have duplicate data points. A workaround was applied to better handle these situations. Even with the workaround, the vehicle may not appear mapped at the exact video location. A wrench icon will appear in the Movies and Geotags window if this situation is detected. An error message is displayed if the user tries to load only 2ndchannel videos. (In order to view 2ndchannel videos, the corresponding 1stchannel video must be loaded. The 2ndchannel will then be loaded automatically.) Previously, Dashcam Viewer would not report an error in this case and basically do nothing.